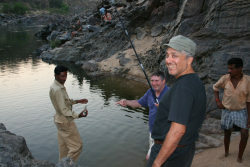 When my husband Keith said he wanted to fish for Mahseer in Indian, I blanched. 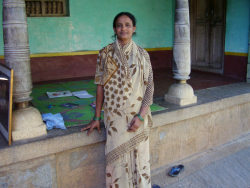 I'm not an angler, I'm a 'fishing widow,' and whilst I go on some expeditions, travelling to India was never on my list of 'a million things to do before I die.' So it was with some trepidation that I joined a group of angling writers, and boarded a BA flight from Heathrow to Bangalore. This was my first trip to the sub-continent, and my expectations were low, but I thought - to hell with it, I might have fun. 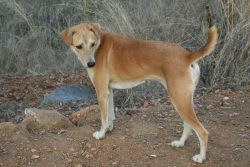 Our destination was Bush Betta Camp, high in the remote hills of Mekhedaatu-Sangam, in the state of Karnataka, south-east of Bangalore, a bone-shaking drive of 140 kms. We arrived in Bangalore in the early hours of Saturday, 1st March, and though it was winter in India, the heat hit me full in the face as we left the cool confines of the airport. It was approaching 38 degrees C., a welcome relief after the cold miserable days of February in England. We were met at the airport by Abdul, an efficient, smartly-dressed man who wore khaki, and black designer glasses. He carried a clipboard. Herding us together, his drivers relieved us of our luggage, and the precious cargo of rod-pods, which they tied tightly to the top of two TATA 4x4's. This was our transport to the wilderness. With their tinted windows and air conditioning, they contrasted sharply with the main mode of transport in the city - the iconic yellow and black taxis known as 'autos,' or 'tuk-tuks' because of the noise they make. I watched with alarm as their smiling, white-toothed drivers tore around the city, dodging in and out of traffic in death-defying manoeuvres. These three-wheeled taxis carry up to three passengers, and those whose faces I saw, appeared to wear frozen masks of horror, their eyes tightly shut, white-knuckled hands gripping the window frames. They also seemed to be praying! I soon learned that 'kamikazee' driving is the norm for bikers, car and lorry drivers who demonically blast their horns at any obstruction, swerving only to avoid a head-on collision. Remarkably, I saw no accidents. Bangalore is a developing commercial centre. Known as 'Silicon city,' after the number of established software companies, it is also named 'The garden city of India,' because of its 240-acre botanical gardens - Lal Bagh Glasshouse is based on London's Crystal Palace and houses a rare collection of plants; the Government stages a twice-monthly festival of music and folk-art in the grounds. Here, ancient culture blends with modern, a symbiotic blend of humanity that bubbles with the vibrancy of a burgeoning economy. We only had to drive half a mile out of the city to witness this eclectic mix; new office blocks and shops vied for space with modest homes. 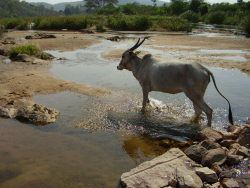 Emaciated buff-coloured cattle, with ridged backbones and protruding hips, wandered from construction sites into the long street markets which line the roads. Locals crouched on their haunches under green striped awnings, where row upon row of fresh fruit and vegetables were neatly laid out. The ant-like activity of people whose lives depend on daily sales of their produce was frenetic, but strangely ordered - each moved with a purpose - and it contrasted markedly with the serenity of bejewelled women, dressed in brightly- coloured saris, irridescent with gold and silver. They swept the entrances to their homes, with brooms made of twigs, and ignored the plastic carrier bags of rubbish with blight the roadsides. Heading out of the city on the second leg of our journey, I noticed a Manchester United poster, advertising their wares; this is an indication that Bangalore is becoming more Westernised and for some reason, I didn't feel that this was a positive development. The road to Mekhedaatu was long and dusty. Away from the city, the traffic lessened, and as we passed through several small villages, pot-holes became car-wreckers, and the need for the loo more pressing! The journey to camp took around four hours, but we stopped en route at a small village school, the large, elaborately decorated entrance to which appeared surreal in the sparse, arid landscape. Our host, Nawabzada Mohammed Saad Bin Jung has royal connections and once played international cricket for India, retiring in his early twenties due to ill-health. 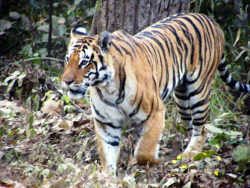 For some years now, he's been actively involved in conservation work, and he has a social conscience. He established a school to cater for village children who wouldn't otherwise have any form of education and he tells tourists to his eco-camp, not to return to India unless they can put something back into the infrastructure. 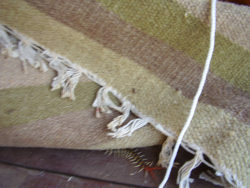 Visitors are encouraged to bring basic skills to the school, such as sewing, woodwork and bed-making. He has also written a book: Wild Tales from the Wild, in which he writes of his experience in setting up his first wildlife camp. 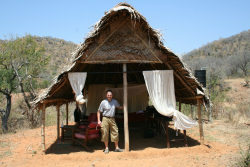 His passion for conservation is clear, for there's a strong eco-tourism message contained within the pages. wade across the river which ran past its gated entrance. The magnificent building was an Ashram, a spiritual place, where wealthy tourists land their helicopters on a helipad - people come to find Nirvana. Is it me, or is this a contradiction in terms? Do people really need that wealth, to find what they already have inside? Yet, at that moment, and after a fifteen-hour journey, it looked so inviting. Then, to my horror, I spotted our host, Saad, and two local guides, on the other side of the river. 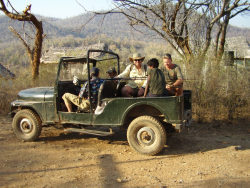 They were waiting to take us to camp in two battered old jeeps. Saad waved to us, and I dithered. Wading the river was a detail my husband had omitted on the outward flight, as we sipped champagne in Club Class (we got an upgrade, because I wore my 'lucky' white shoes!) He also failed to tell me that there were crocodiles in the river! My response to that was total disbelief - until later, when my jaw hit the ground as I watched a fourteen-footer basking in 'Crocodile Pool' below camp. Shoes and trousers dripping wet (I wasn't taking them off for anyone) I climbed into the back of the jeep, along with four companions. Someone forgot to close the tail-gate, and as we were transported at speed up a steep and rocky incline, we velcroed our hands to the anti-rollbars, to stop ourselves from toppling out backwards, and in complete embarrassment as we bounced over rocks and boulders, I had to grip my over-sized breasts with my free hand as they attempted to dance the rumba! Camp was a ramshackle assortment of nine palm-thatched huts, built on bamboo stilts into the hillside, some 45 metres above the wild and beautiful River Cauvery. Saad is responsible for a seven mile stretch of this river, which has a chequered political history. 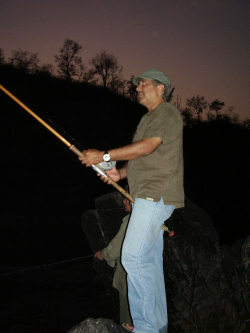 He is passionate about the habitat and preservation of the Mahseer, which it seems is in decline. 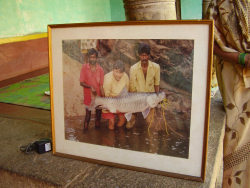 In the '90s, he caught a fine specimen of 107 lbs., and has a photograph in proof. Of late, the large fish are harder to find, even though the river is teeming with smaller specimens in pristine condition. Poaching is endemic, and dynamiting downstream, a real problem. Saad's answer is to provide tribals with jobs at camp. 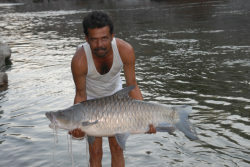 They protect the mahseer, and receive payment for looking after ecotourists like us, who go there to fish for this magnificent creature. His strategy works well at this sanctuary, and captured fish are handled with great reverence. 'Catch-and-release' is practised on the Cauvery, and I was fortunate to see those spectacular black, gold and silver-scaled fish close up; I felt privileged. Then, I watched as, with a slight flex of their muscular fins, they swam strongly away into the mysterious and hidden depths of this sacred river. 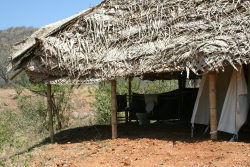 Bush Betta camp is situated miles from habitation, and it's easy to feel vulnerable. No shops. No supermarkets. No hospitals. 'Heck,' I thought, how do people survive? 'What about health care?' I asked Saad. 'What about it?' he replied. 'Is there a loo?' I didn't fancy a spade and bare bum in the jungle! And when I was reassured by our eccentric organiser that there was, I was content. In truth, the loo, washbasin and, wait for it ... shower, were screened only by green plastic sheeting which frequently blew open, usually as one was seated, contemplating the meaning of life (India does that to you). It was the ultimate 'loo with a view,' and the only eyes to observe that most basic of human functions, were those of macaques, long-tailed langurs, owls, or the solitary barking deer. It took us a few days to learn not to leave food, or anything shiny in our huts; otherwise we could expect frequent raids from the troupe of monkeys who descended on us like SWAT teams. They stole mints, toothpaste, sunglasses and hats and we spent most of our stay searching for monkeys with gleaming teeth, fresh breath, and cool look! Saad's dogs, 'Black' and 'White,' were an integral part of camp life. Not only did they alert us to the monkey-raiders, but decided to join me early one morning in the shower, drinking at my feet from the puddles of soapy water which had nowhere to drain but the dry earth. It seems that nothing is wasted in the jungle; but they also caused sleepless nights, because they were a danger-warning of approaching wildlife. One night, Riva, the beautifully calm angling widow of a mad fishing journalist; Angie, the tall, willowy glamour model with an all-over tan and laid-back approach to life, and I, a short-legged, myopic pensioner with an active imagination, were alarmed into action as the dogs snarled and barked frantically at something which approached in the black, moonless night. I sat bolt-upright in bed and then, remembering I was wearing a luminous white nightshirt which glowed like a beacon in the dark, threw myself backwards, cracking my head on the wooden bedhead, in a vain attempt to camouflage myself with a thin blanket. Typically, amidst the cacophony, all three husbands snored, deep in the arms of Morpheus, and didn't hear a thing! I gave my other half a sharp dig in the ribs; he stirred, rolled over and went back to sleep, after telling me not to be so stupid! I was wide-eyed - we all heard a powerful, deep-throated growl, which we vaguely recognised from nature programmes on BBC2, but couldn't quite place. We were convinced it was a tiger. According to Saad, big cats such as tigers and leopards, eat camp dogs, finding them easy prey and that night, we thought 'Black' and 'White' were on the menu! The dogs had sought refuge in Riva's hut, so the next day over lunch, she came up with a defence plan. She would sleep with a bowie knife under her pillow, and should a cat attack, she'd wait until it leapt, and stab it through the heart! Her husband Keith has a bizarre sense of humour. He told her she was more likely to cut off an ear whilst sleeping than despatch a jungle predator! 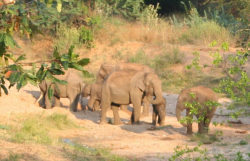 Wild elephants, tigers and leopards; those were the heart-stopping creatures we'd hoped to see on our adventure to India, but what we largely encountered was something smaller, and much more manageable. On a 'yuk' scale of one to ten; bright yellow spiders (poisonous? ), horned lizards, and stick insects were a two - centipedes, a definite 12. He's expert at catching these fabulous fish, but that morning, they'd caught little, and were asking questions. What had changed? 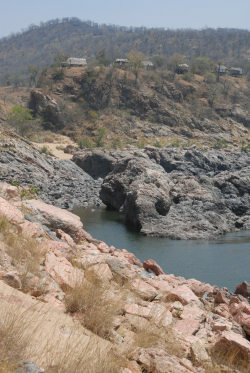 Had the river temperature dropped because of water released from the dam higher up? 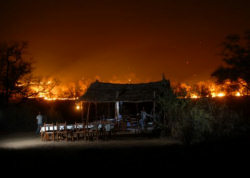 Had last night's forest fires which surrounded the camp, affected the fish? Even worse; had the 'mugger' crocodiles who lurked in the hidden depths of the river, turned bulimic? Where were the big fish? They didn't know, and were looking for answers and as Keith sat in the rocking chair in our hut, mulling over their lack of success, he spotted something moving. His old blue underpants lay crumpled on the wooden floor, just where the macaques, not finding anything tasty, had tossed them in disgust on their last raid; and something was wriggling inside. He called me. 'Sandy - come here - look at this!' Ever keen to spot wildlife, I grabbed the camera; my eyes following the direction of his extended forefinger, and I shuddered. 'Riva ... Angie ... look at this,' I cried. They came running, just in time to see a centipede of 15 centimetres, its fat, squidgy, multi-legged body disappearing into a two- centimetre crack in the floor. It was disgustingly pliant. I know, because I prodded its hardened carapace with a pencil as I flicked it from its hiding place in the Y-fronts. I took this blurred photo - I wanted to identify it, but its broad crimson strip warned me that the darned thing was probably poisonous. It made my flesh creep, and with some relief, we watched as it dropped through the boards onto the sloping hillside beneath. I still don't know its genus - I'm sure someone can tell me - but I remember with clarity, that illuminated look on my husband's face. He was wondering if it would make good bait for Mahseer. I was wondering; had he donned his underpants and been bitten by the monster, who would have sucked out the poison? Not me that's for sure!